Whatever the reception he receives Daryl Powell says he expects to enjoy his first return to Featherstone Rovers as head coach of Castleford Tigers. Powell takes his Tigers team to the Big Fellas Stadium on Sunday for their latest pre-season warm-up and is predicting a tough test for his Super League players against a Rovers side who have been impressive so far in their trial matches, beating Hunslet, Wakefield and Halifax. With local bragging rights at stake there is more on the game than the usual pre-season match, but the return of Powell to the club where he was so successful as a coach for five years before switching clubs last year will arouse much of the interest. With Powell there will also be his former number two at Featherstone, Ryan Sheridan, who has now been appointed player performance manager and under 19s head coach at Cas. And making it a hat-trick of returning Rovers heroes will be player Liam Finn, who until recently was captain of the Championship club . 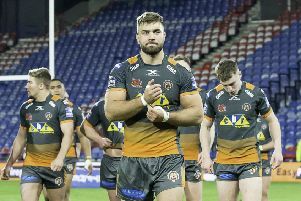 For Powell it may be a little strange being in the away dressing room and dug-out, but he is looking forward to his return to the Big Fellas Stadium. He told the Express: “When you go back and you’ve been at a place a long time then it’s always difficult, but I think I’ll go and enjoy it. “I had a pretty good time there and I really enjoyed it. The club’s grown from strength to strength over the last five or six years and it was good to be a part of that. “Times change and I’ve moved on, but I still hold fond memories from my time at Featherstone. “I hope I get a good reception from the home fans. I got on well with them in my time there. We had some great times and some tough losses too, that’s professional sport. “I’m sure I’ll get a few boos as the fans are pretty vociferous and want to win every game they play, which is great when they are behind you. Powell expects Sunday’s game to have a competitive edge, which will be ideal for his players as they look to step up their preparations for the start of their Super League campaign next month. He said: “It’s going to be interesting on Sunday. “Obviously I know the club pretty well and I know a lot of the people that are involved there and obviously the players as well. “It’s going to be challenging for us. They played well against Wakefield the other week and we see it as a good opportunity for us to take a step in the right direction. “If you are going to improve you need to be challenged and we will be at Featherstone. It’s a perfect game for us. “I’m expecting a hard game. Conditions at the moment are heavy, we found that out ourselves last Sunday. The Featherstone pitch tends to drain well, but it looks like there will be some rain at the back end of the week so it should be quite heavy. Powell is taking a strong squad and hopes to give a run out to several players who have not previously played in pre-season. He added: “It will be a strong team. It’s not like in the past when we had under 20s teams. We don’t have them any more so you are picking from your first team squad. “I will also be hoping to give a run out to players who haven’t played yet or who haven’t had much game time. “Michael Shenton and Weller Hauraki, who haven’t played to date, will be in and I’m hoping Adam Milner will be coming back from injury this week and will get an opportunity to play. “Ashley Gibson will hopefully spend some time on the field after his injury and Kirk Dixon didn’t play the other day so will be involved this week. “I was pretty scarce with Craig Huby and Andy Lynch’s game time last weekend so they will get longer on the pitch.